Equality and inclusion are at the core of our charitable aims and we are committed to working to removing barriers that might prevent young people from accessing our opportunities. We want our company of UK-wide young talent to represent and celebrate the diversity of Britain’s youth in all its forms and alongside our nationwide auditions and interviews we run targeted programmes to create access routes into our membership for young people with characteristic that are currently underrepresented. As part of this commitment we are a Cultural Inclusion Manifesto supporter. 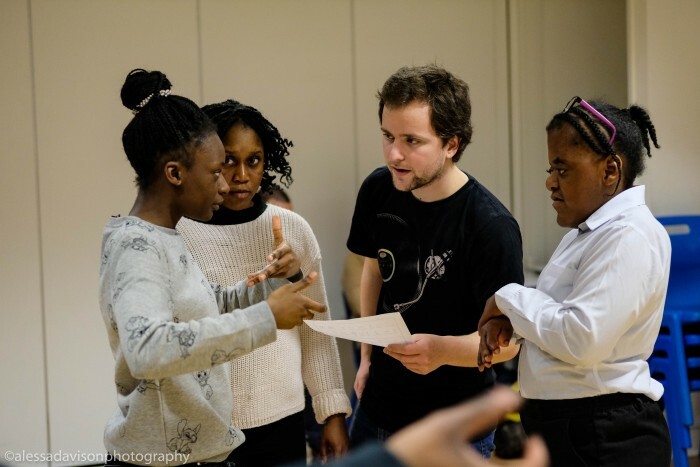 In 2018 we launched a new Inclusivity Programme designed to make National Youth Theatre more accessible to disabled and neuro diverse young people, in partnership with Diverse City and Highshore School in Southwark. The project follows previous inclusion work at NYT, including the 2012 Paralympic Team Welcome Ceremonies. In January 2018 we began a partnership with our friends at Diverse City surrounding our inclusion programme, who worked with us to deliver free Inclusion Training to our pool of NYT Associate Artists. The following month, a team of NYT associates and members who had completed this training met staff at Highshore School, a SEN School in Southwark, and spent a day training within the school where we met students and staff in lessons and during break times. Our aim was to work with every class in the school at Highshore School - from year seven to the top of sixth form. We achieved this over the Spring term and did 45 minutes to 90 minute workshops with each class, working on ensemble and confidence skills, team work and storytelling. We went in once a week with a mixture of NYT members and associates and each class was given a taster workshop, whilst our NYT associates were building up experience of working with neuro diverse young people. National Youth Theatre full-time staff also took part in delivering these sessions as part of NYT’s Volunteering Strategy. Following NYT's work with every class at Highshore, four classes were selected to devise a piece for a performance within Highshore School during the Summer term of 2018. Over several weeks, NYT worked with the classes for half a day a week to create and rehearse the pieces whilst building up skills including movement, voice, script writing and responding to direction. The theme was Superheroes and using puppetry, physical theatre, ensemble movement and comic scenes each class created their own 10 minute piece based on the theme and performed to the whole school, parents, carers and governors. It was a resounding success and received a very positive audience response. In August 2018, NYT and Extraordinary Bodies (Diverse City and Cirque Bijou) collaborated with Highshore School students, NYT members, people from the borough of Southwark, Extraordinary Bodies Young Company and the National Theatre on a circus theatre show called What Am I Worth. NYT associates and members worked with Highshore School students to make up the community chorus for the outdoor show, creating three original scenes, performing a song, a dance and a catwalk. As part of Stage Three, NYT also collaborated with Southwark Playhouse during our Spring Season to provide work front of house and backstage work experience placements for Highshore School students. In early 2019 we ran a weekly drama club as a pilot for 12 Highshore School students with an interest in acting and drama, supported by three associate directors, two assistants and several NYT members, and through this auditioned them to join National Youth Theatre's membership. We worked on skills including devising, monologues, ensemble development, voice and movement. We are currently in dialogue with potential supporters to extend this pilot to other locations and other schools. We’ve also commissioned a series of productions exploring themes related to inclusivity that will be developed in 2019 ahead of potential productions in 2020. We’re grateful to Boshier Hinton, the Mackintosh Foundation, and the Jules Thorne Charitable Trust for their support of our inclusion programme.